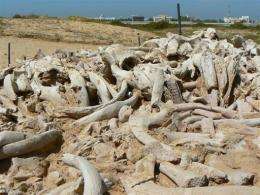 French archaeologists have discovered the oldest known place of worship dedicated to the dugong, or sea cow, on an island just north of Dubai, two research centres said Thursday. The sanctuary believed to date back to 3,500 to 3,200 years BC was discovered on Akab island in the United Arab Emirates, 50 kilometres (30 miles) north of Dubai. The French archaeological mission in the Emirates and the Umm al-Quwain museum there said in the specialist magazine Antiquity that the sanctuary on the deserted island provided key details "on the rituals of prehistoric coastal societies in the Gulf." Akab was a tuna fisherman's village more than 6,500 years ago with circular buildings and a pile of dugong bones detected in the 1990s. The scientifically named "Dugong dugon" still exists in the Gulf, with adults growing up to four metres (12 feet) long and weighing up to 400 kilogrammes (880 pounds). The sanctuary was first thought to be an abattoir but on analysis was found to be a carefully constructed platform on two levels containing the remains of around 40 dugongs as well as tools, stones and ornaments. The archeologists said the Akab monument was used for rituals celebrating the giant mammal and "has no parallel in neolithic times in other parts of the world." Similar structures have been found off the Australian coast but are only several hundred years old.